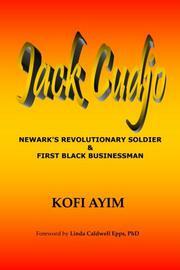 A black soldier fights in the War of Independence and later finds fortune in Newark. In his nonfiction debut, Ayim surveys the life and times of “Jack” Cudjo Banquante, a Revolutionary warrior for a cause to which he owed little and a horticultural importer in Newark after the conflict ended. Born the child of slaves around 1723 and probably sold by Dutch traders, Cudjo was purchased by Benjamin Coe of Newark and sent into combat in the owner’s stead. As a member of the 1st Battalion, 1st Company of the Revolutionary Army, Cudjo clashed with British forces at Yorktown, Valley Forge, and alongside 800 other black soldiers at Monmouth, the largest battle of the war. Despite the fact that Cudjo’s “military record is as obscure as the records of many slaves who sacrificed limbs and souls during the Revolutionary War,” Ayim proceeds to weigh all the period documentation about the hero: his service, his later career as a cultivator and merchant of exotic plants, and his marriage and progeny. Thrust into the worldwide nightmare of chattel slavery, Cudjo fought bravely in a war he didn’t choose and later became so admirable around town that “even children born in slavery were named after him.” More than an account of one man’s struggles, Ayim’s book is an engrossing primer on the Akan people of West Africa—the horrors they either died from or endured in the trans-Atlantic slave trade—and a meditation on this brutal institution in the Northeast, a region that likes to fancy itself untainted by such barbarity. Of Akan heritage himself, the author proves himself a worthy guide and admirable documentarian on the later dispersion of Cudjo’s family as well as the ensuing history of Northeastern slavery. Although “the state of New Jersey officially abolished further importation of slavery in 1786,” Ayim tells readers, “yet 74 years later (1860) eighteen slaves were recorded in the census.” Subsequent researchers will likely be obliged to the author for the hours he spent fishing pearls from the archives, and readers with an interest in American history of all kinds will encounter a story they should know. A comprehensively researched and absorbing study of a freed slave’s life.